The island of Anglesey where Prince William and Kate Middleton are expected to live after Friday's wedding is enjoying a tourism boom. They attended their first official engagement as a couple there where the prince is based as an RAF search and rescue pilot. Television news crews from around the world have arrived ahead of the wedding. Tourism managers said it had brought publicity money could not buy. 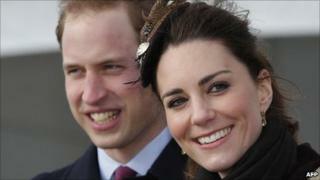 The prince is based at RAF Valley which his grandmother the Queen toured earlier in the month. He did part of his training there before qualifying last September and the couple now rent a property on the island. Miss Middleton has been spotted on several occasions shopping at Menai Bridge but locals say the couple have been living undisturbed in the area since he started work there. The manager of the White Eagle pub and restaurant at Rhoscolyn, a short distance from the RAF base, refused to comment on newspaper reports the couple call there. But Adrienne Owen said just the suggestion that they could be customers has brought new people in. She said: "We've got a lot of media interest at the moment, we've had Canadian news, ABC news, New York news, Australian, the Italians. It is having a big affect on the island which is really good for us." But Ms Owen said she hopes that after Friday is over the couple will be allowed to get on with their lives in peace again. "It would be nice for him to be just a normal lad on the island," she added. Mike Thomas, from Anglesey's tourism and marketing office, said the current publicity was priceless. "Our budget is quite limited - we probably only spend in the region of about £30,000 year on year," he added. "We physically couldn't buy half of the publicity that's gone out at this time so in terms of that it's fantastic, it's what money can't buy. "We have been lucky with this. We've had a 300% increase in the number of unique users coming to our website. "In terms of tourism, some of our businesses are reporting a 20% increase in their business this year. "The trick is going to be engaging with the media ensuring that these benefits do go on." When the couple launched a new RNLI lifeboat at Trearddur Bay on Anglesey in February it was their first official engagement together. The publicity they have brought to the island has not been lost on those further afield. An Anglesey version of the board game Monopoly is coming out later this year. Publicist Graham Barnes said: "Anglesey was always on the radar and we were going to do a game sometime within the next few years for select places in Wales. "Prince William is living here - it has put a spot light on the island so yes that's the reason why it has been selected for this year."